Copyright 1997, Silas Kayakjuak, All Rights Reserved. Originally from the Nunavut Territory of Canada, Silas Kayakjuak (Qayakjuak) is an Inuit artist a who now lives in Ottawa, Ontario, Canada. Kayakjuak began carving images of the human form by the age of twelve and has made numerous sculptures over the course of his life. The artist favors the use of indigenous materials such as antler, deer bone, ivory, sinew, whale bone, serpentine, walrus jaw, stone, and steatite. He depicts traditional scenes from his Inuit heritage. Kayakjuak learned how to carve from his parents, Joanasi and Martha Kayakjuak, both of whom were also artists. In Birthing the Old Way, Kayakjuak depicts a woman who kneels as she gives birth, her baby crowning visibly beneath her. In my correspondences with the artist’s agent, I have learned that the artist depicts birth in what he describes as the “old way,” which refers to birth before the introduction of medical intervention to traditional birth practices. The image is helpful to the laboring woman because it offers a depiction of a woman at peace as she gives birth. In this case, the positioning of the baby is that of a posterior, forward-facing baby. 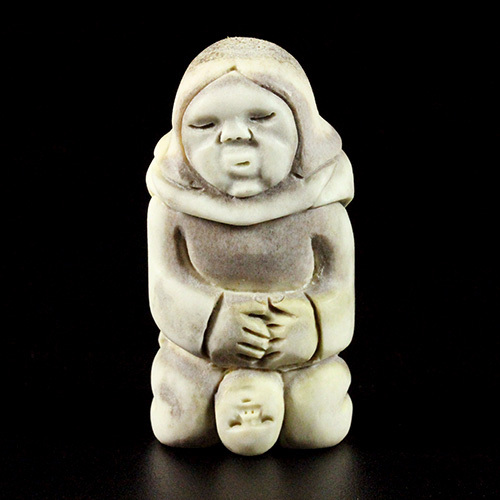 While often more arduous for the mother in her delivery of a posterior baby, she is capable of birthing the baby in this manner, and Kayakjuak’s representation offers a serene depiction of such a birth. For another post on Visualizing Birth previously visited the work of Kayakjuak back in 2011. For more material on the artist’s work, see the artist’s page on the Snow Goose website, as well as Aboriginart Galleries and the references listed below. Brandon, Lorraine E. Carved from the Land: The Eskimo Museum Collection, Churchill, Man. : Diocese of Churchill Hudson Bay, 1994. Qayaqjuak, Silas. Silas Qayaqjuaq Wants to Share Ideas with other Artists: Interviewed in Inukttitut by Simeonie Kunuk and Mathew Fox (English, 1994); translation by Rhoda Kayakjuak. Inuit Art Quarterly 10.1 (Spring, 1995). 22-55.